These 'treats' look good enough to eat ... but we don't recommend it! From frosted cinnamon buns to glazed doughnuts and even bowls of Froot Loops cereal, these tasty looking treasures look good enough to eat — but we definitely wouldn't recommend it! That's because, though they may look delectable, they’re actually bars of soap created by Leeana O'Cain of LoveLeeSoaps in Florida. O’Cain started creating these bubbly wonders in 2007 when she was just 18-years-old and a senior in high school. She has since sold over 23,000 bars on Etsy — and that number doesn't even factor in all of the sales directly from her website. The soaps, which are individually molded, can be fashioned into animals, sweet treats or even the typical bars. The soaps themselves contain ingredients like sodium cocoate, propylene glycol, water, sorbitol, moisturizing agents like glycerin and shea butter and, of course, unique fragrance oils and colors. In addition to being a big hit at wedding showers and holiday events, O’Cain has been working to grow her following on Instagram by sharing show stopping photos. Yes, the soaps look yummy, but don't try them. “They do not taste as good as they smell,” O’Cain cautioned. Here's to hoping we never have to find out. Now, O’Cain is hoping to encourage other young entrepreneurs to forge ahead in starting their own businesses. After all, she knows first-hand how quickly hobbies can become fulfilling occupations. Check out more of O'Cain's gorgeously, drool worthy creations! Don't be fooled! 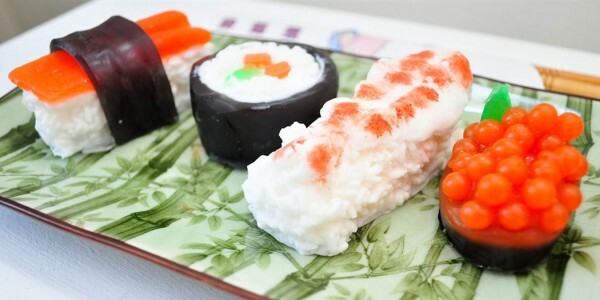 These soaps might make you think twice before biting into a chocolate eclair or sushi roll.